Now that the dust has settled after the thrilling experience of opening the O.Henry Hotel and Green Valley Grill, we’ve slowed down long enough to ponder our company’s future, and we’ve made some decisions. …slowly, carefully, and close to home. We can be more effective at meeting and exceeding our guests’ (and staff’s) expectations if each key member of our team is personally involved in our growth. And we’re more likely to stay personally involved if we don’t spread ourselves too thin. 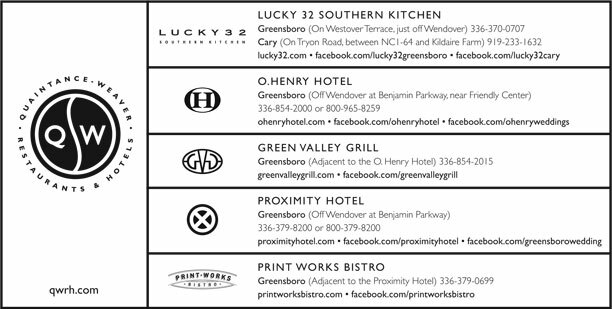 This winter we’ll begin construction on our new Lucky 32 in Cary (on Tryon Road, between US 1-64 and Kildare Farm Road). We’re not sure what will come after that, but I can say that we’re working on some exciting opportunities. We’ve decided to do some fine-tuning. Since we opened our first restaurant eleven years ago, we’ve been learning from experience and guest feedback. We’re ready to apply what we’ve learned to our existing restaurants. We’re enhancing our flavors, perfecting our service, and updating our restaurants’ environments. purchase more locally grown ingredients– especially herbs and produce (don’t be surprised if you run into us at the farmer’s market early one Saturday morning). attain higher levels of service. We know that your experience in our restaurants and hotel has so much to do with our service staff. That’s why we’re concentrating our efforts to ensure that our staff is extra-ordinarily knowledgeable and helpful. update our restaurants. I think you’ll enjoy the warmer surfaces and softer, more intimate lighting that we’re designing. To get a feel for some of our decorating ideas, take a peek at the newly installed marble floor in the bar at Winston Salem’s Lucky 32. In short, we just want to make doggone sure that we take good care of our guests. We promise flavor, consistency, hospitality, comfort, and value. I hope you’ll let me know how we’re doing. Call, visit (our addresses and phone numbers are at the end of this letter), or you can e-mail me at dq@qwrh.com. We’ve always approached our wine lists with a focus on variety, quality, and value, but this is the first year we’ve submitted our lists to a national publication for review. In the September 2000 issue of Wine Spectator, our lists received the Award of Excellence. At Lucky 32 we offer over 50 wines with more than 25 by the glass, plus some half bottles. Green Valley Grill features over 150 wines with more than 35 by the glass. We offer a reserve list including rare wines that are limited in quantity and have more bottle age. Half glasses of wine are available so you can experiment! If you have a suggestion for our wine list please let our wine director, Julia Warren Schiavone, know. You can reach her by e-mailing julia@qwrh.com, calling 336-370-0966, extension 309, or by writing to P.O. Box 29228, Greensboro, NC 27408.